Juices that are organic, cold-pressed and seasonal is Juice Kitchen’s promise. ONE-STOP food markets are hardly new. But here’s one with a difference. A market that focuses on organic products, quality artisanal food and homegrown restaurants. So, no KFC, no Domino pizzas. No McDonalds. No Starbucks. Sure, there’s a place for those chains, just not at The Market, a permanent fixture at the Ballito Lifestyle Centre taking up 1600 m2 of retail space. This is no flea market with imported tat. Instead it’s a sophisticated food paradise offering home-grown, local and community-based food and produce. And it is, right now, the only indoor artisanal food market trading seven days a week in South Africa. As impressive as its ethos is its stylish design. Sort of industrial chic with touches of country rustic. The layout of the shops and eateries is attractive and original. Even though its basically open plan, every outlet has its own distinctive area, interspersed with eating spots. The eating is largely communal with long tables and benches grouped in different areas. So, ideal for big groups – or a place to make new friends. But there are also tables for two or four if you prefer intimate eating as well as sofas and soft chairs if you want to chill in total comfort. It’s the perfect place to while away a Sunday morning, starting with breakfast and coffee or a fresh fruit juice. Before long it’s time to buy ingredients to take home to make lunch. Feelingly lazy? There are several options for take-outs. There’s a pizza and chicken outlet, curry and sushi bars, a butchery, delis, bakery, frozen meals, a speciality coffee roaster, a fresh juice bar, a brewery and more. The Market is a whole new food and eating adventure. I love it. The vibe is amazing, the service friendly and the look is 21st century cool. The range of producers is varied and all the selected merchants have stories to share about their passion and their commitment to their produce. Here are some. This information was taken from The Market’s web site and edited. These small-batch artisan ice cream makers are passionate about making the best seasonal ice cream and sorbets, waffles, milkshakes, ice cream cakes and vanilla sugar cones. The team is also passionate about producing ice cream that stirs your soul and are committed to sourcing the best local ingredients to produce flavours that speak to your senses. Free from artificial colouring and flavours. That’s a promise. Speciality roasters, Science of Coffee sells only the highest quality coffee beans from Africa. Passionately driven by science, Science of Coffee micro-roasts coffee to an art. Sample coffee beans from different locations, enjoy your favourite brew or select a speciality roast to enjoy at home. It’s operated by Yoli’s. Amy, Jane and Didee Weare prepare wholesome, tasty and affordable frozen dishes that can be enjoyed anywhere. Having created We Are Food in 2013 in response to a demand for healthy home-cooked meals, The Market is home to their first retail outlet. This is a family run business that promise to cook for you as you would cook for your own family … maybe a little better! Established in 1984 in the heart of Durban, the Bavarian Butchery and Delicatessen has a rich heritage and delivers a true German experience, from delicious eisbeins to tasty sauerkraut and smoked ribs. Located in a beautiful corner of The Market, the Bavarian Deli also offers a wide range of local and imported cheeses and imported treats. Incredibly delicious free-range chicken and satisfying hearty pizza are what the new trendy Bird & Co have to offer! 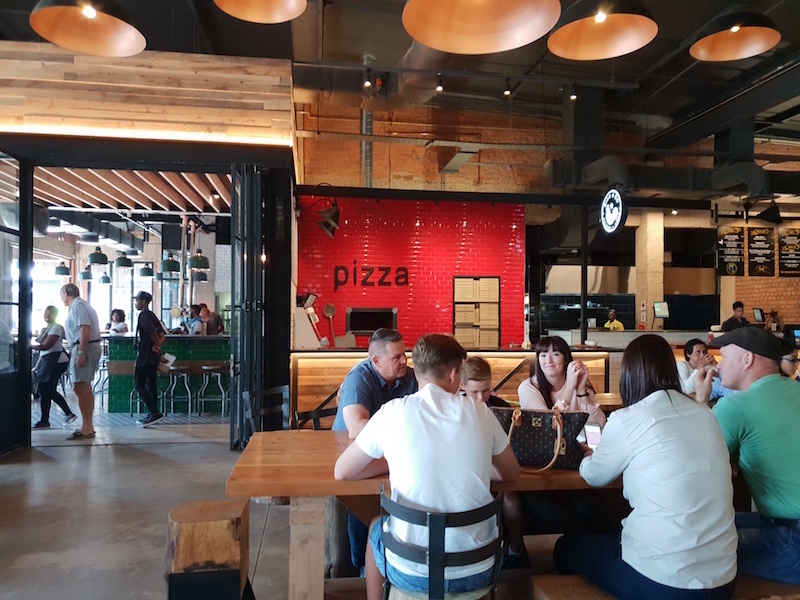 Well-known local restauranteur Christo Paterimos has rounded up some of his favourite mouth-watering dishes, bringing this exciting new chicken and pizza concept to The Market. Prithie Bodasing, owner of Cumin & Coriander has a passion and flair for Indian cuisine. Her love of cooking and catering has led her to open her first retail outlet at The Market. Made fresh daily, her offering ranges from deliciously filled samoosas’s, the most scrumptious bunny chows on the north coast, to roti’s and daily curry specials. Local restauranteur Anton Petzer has collaborated with food doyenne Jacqui Rey to bring the most delicious seafood and sushi to The Market. Select your freshly-made sushi piece by piece or tuck into lightly battered fish & chips, calamari or fishcakes with a Thai dipping sauce. You can also choose from a selection of fresh fish (caught and supplied daily) or frozen seafood to take home. Dawn de Beer is passionate about supplying fresh whole foods to her local community and launched Home Grown in February 2013. Her business has grown tremendously since then, culminating in her newest venture in a beautiful open space at The Market. Her wares include local, organic and seasonal produce, free range eggs, organic milk, full cream cheeses, yoghurt, hormone free meats & artisan salamis. 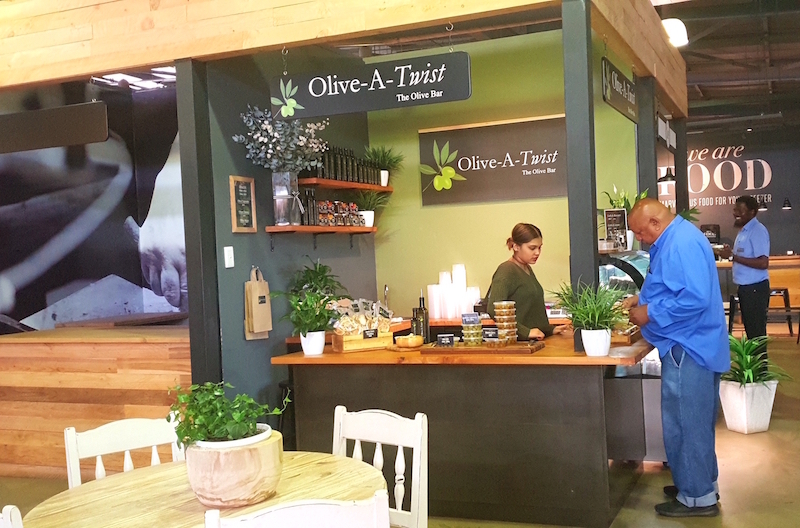 Offering a range of delicious of olive products. One of South Africa’s oldest craft beers that pioneered bottle conditioned beers in South Africa and introduced beer lovers to IPA’s, Steam Beer and sparkling ales, Robsons has arrived in Ballito. The Stewart family produce handcrafted beer, using only the finest ingredients in natural processes with no artificial additives. Enjoy Robson’s Durban Pale Ale, Robson’s Durban Export Pilsner, Robson’s East Coast Ale, Robson’s West Coast Ale and more. The Harrod’s of butcheries, you can expect the best meat, poultry, biltong, deli items and so much more, combined with the best service at Taylor’s It’s like visiting your local butcher of old. 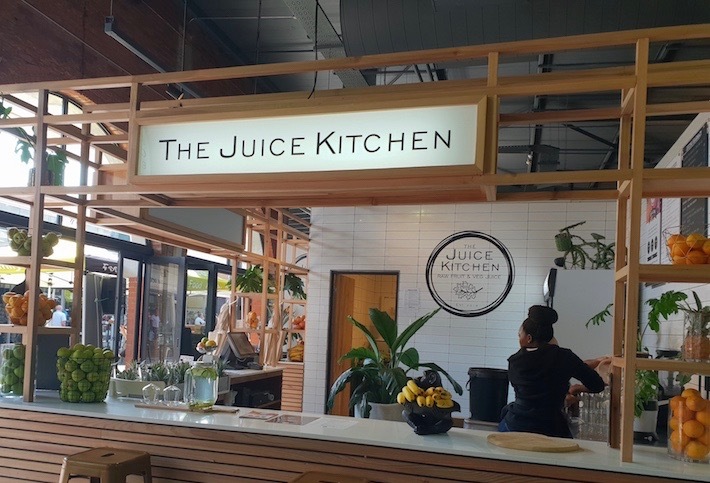 Situated near the entrance to The Market, The Juice Kitchen is a gorgeous fruit juice and smoothie bar, making raw fruit and vegetable juices and smoothies, as well as seasonal fruit cups, soups and salads. All their juices are organic, cold pressed and delicious! Tree Natural Café’s philosophy is about living life naturally. 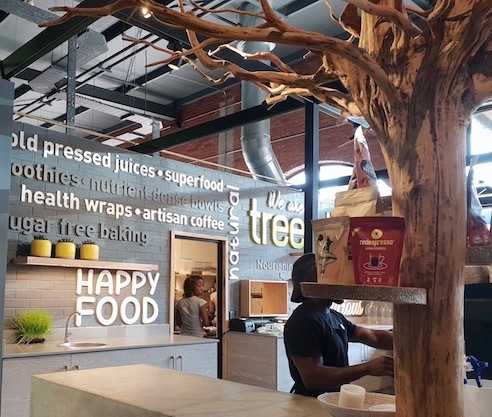 In an age where so much illness and disease is present, Tree Café’s focus is on nutrient-dense foods, juices and smoothies, prepared with thought and care. Pastry chef Nikki Cooper, her husband Derryn and their team of local bakers bring good old fashioned baking to the Dolphin Coast, with their use of stoneground flour and artisanal methods. With a view into their kitchen and prep area, a gorgeous display in a beautiful French-inspired setting, friendly staff and delectable breads and pastries, Yolis is a feast for the senses. The Market is open from 8am daily, closing at 6pm Monday – Saturday and 5pm on Sundays. The restaurant section stays open till late.